Where is home and how do we find our way there? Listen to Michael in the following videos on the Power of Place and Placemaking. What makes a place, a place? In his presentation at Chautauqua 2010 exploring innovations in transforming higher education, Michael Jones, a widely recognized leadership educator, speaker, writer and pianist-composer shares his story about he found his own sense of place playing to the wind and rain and accompanying the dance of light on water near Georgian Bay Ontario. Interview with Michael, who participated in the Tamarack’s Communities: Programs and Policies event in Kitchener, Ontario on 23-26 June, 2014. This entry was posted in Placebased Leadership, Soul of Place and tagged belonging, homecoming, regeneravity. Bookmark the permalink. 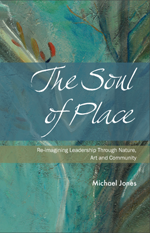 In his book, The Soul of Place, Michael Jones explores how our relationship with place in nature, art and community deepens our connection with the core energetic patterns that form the undercurrents of life and living systems. The Soul of Place is supported by the Fetzer Institute. The Soul of Place is available from Friesen Press.